You are here: Home / Re-Pigmentation / Vitiligo Repigmentation Success Story – Caroline H.
I recently had the pleasure of connecting with Caroline, the owner and creator of TheVitPro.com. When I was first diagnosed with vitiligo three years ago I used to spend a lot of time on her website, since it was the only site of its kind at the time. I desperately needed hope that I could heal my vitiligo. She was a great inspiration to me and I know she will be to you too as well. She has so graciously offered to tell her amazing story, and I’m sure you’ll enjoy it just as much as I did! Read it carefully, because it contains LOTS of gems. If Caroline’s story doesn’t convince you that you absolutely can get control of your vitiligo, then I don’t know what else will :D! 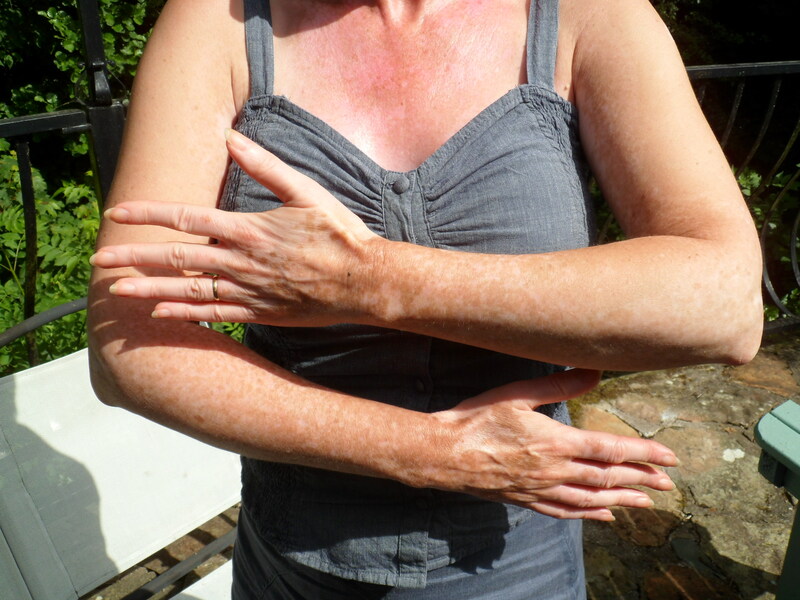 Caroline, when and how did your vitiligo start? My first white patches appeared, according to my mother, when I was a toddler. The very first one was on one inside ankle bone. It looked a bit like a small leaf, so the assumption was that a leaf might have been stuck to my skin while I was out in the sun and left a pale mark. However, it was soon followed by small patches on my spine, at the corners of my eyes and corners of my mouth. By the time I was a teenager I had “panda eyes” that I carefully camouflaged with makeup and patches on the backs of my hands which I discovered could be masked by dabbing them with cold teabags and allowing the residue to dry. The resulting colour was quite a good match for my natural skin tone but it did have the disadvantage of making me smell like a well-used teapot! So I soon moved on to fake tans. During adulthood more and more pigment disappeared, leaving my whole face and around 80% of my body depigmented. Some of the lesions were immediately preceded by a bumpy rash and intense itching. 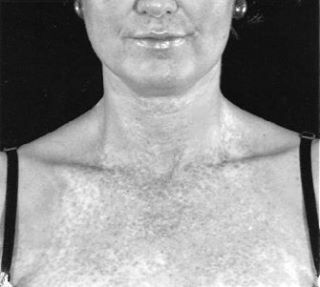 Other areas of skin simply faded gradually over a period of days or weeks until there was no colour left. Eventually many of these patches joined up leaving whole sections of my body (face, chest, lower legs, forearms and hands) completely white. As a child I suffered from tummy cramps and constipation and this developed into full-blown IBS in adulthood. I am convinced that these digestive issues were the root cause, not only of my vitiligo, but also of a number of other ailments – Chronic Fatigue, sinus trouble and arthritis – all of which gradually developed over the years. The most likely scenario, I believe, is that I have a “leaky gut”. This is a condition which leads to food particles being absorbed before they have been properly digested. The result of this is that larger food molecules get into the blood stream. These large molecules are identified by the immune system as being “foreign” and are likely to be mistaken for viruses or bacteria. When this happens the immune system launches an immune response against these harmless molecules, causing inflammation which can evidently lead to a whole host of diseases and a bewildering array of symptoms including chronic allergy, arthritis, skin rashes, eczema, psoriasis, food allergies, IBS, chronic fatigue syndrome, hepatitis, pancreatitis and, it seems, vitiligo. In addition to causing an autoimmune response, I think it is also likely that this digestive disorder led to a deficiency in the nutrients involved in melanin production. Apart from generally avoiding obviously unhealthy choices like too much sugar and highly-processed foods, I didn’t make any major changes to what I ate. I didn’t cut out alcohol either (I enjoy a glass of wine and even the occasional gin and tonic!). And I didn’t avoid meat, although I do believe that the more vegetables you can incorporate into your diet the better, especially green, leafy veg because of its high nutritional value and antioxidant benefits. With hindsight, I now wonder if I might have repigmented even faster if I had been more disciplined in my food choices. Nowadays I am more careful because I have learned a lot about good nutrition and food intolerance over the past few years. For example, I keep my gluten intake to a minimum because I have noticed that my digestion seems better when I do this. Do you recommend supplements? If so, which ones? This is what made all the difference for me and I believe it is the reason why I was able to repigment whilst continuing to eat a normal diet. I tried several different supplements – just as an experiment and not with any real expectation that they would help – from a company whose beauty products I was using in my Image Consultancy work at the time (this was 2010). The reason I did this was that one of them, called Boost, was described as a formulation of “15 different vitamins, minerals and nutrients to supply the body’s natural tanning process” and this made me wonder if it might be able to stimulate my inactive pigment. I also started to use a green superfood blend called Five a Day + from the same company. This was a powder mixture of “22 nutrient dense foods that are rich in natural enzymes, minerals, amino acids, vitamins and antioxidants”. Evidently, one teaspoon of this powder mixed with water delivers an equivalent dose of nutrition to several plates of leafy vegetables so I am guessing this may have compensated for any imperfections in my diet. A full list of the ingredients in these supplements is on my story site at http://www.thevitpro.com/the-treatment-that-worked.html. What topical treatments do you use to help you repigment? I didn’t use any topical treatments during my repigmentation. I had previously tried a Chinese herbal treatment which had to be applied to the skin but it resulted in quite severe burns. Once they had healed they did reveal some freckled pigment but it was definitely not worth the pain involved so I would not try it again nor recommend it to others. Recently I have started to use coconut oil with a small quantity of neem oil mixed in as a moisturiser because my skin is quite dry and both oils are 100% natural and high in antioxidants. It is now well documented that vitiligo sufferers have an over-accumulation of hydrogen peroxide in their skin, so my approach is to provide as many antioxidants to combat this as possible (by using the Five a Day+ from the inside and the natural oils from the outside). Without a doubt, I think that the two supplements were the reason for my recovery. But there were also some other contributory factors. One was regular, moderate sun exposure because, without this, I don’t think the dormant pigment would have been stimulated into action (or at least it would have taken a lot longer). I was fortunate enough to start this process during the Spring. But, once the Summer weather ended, I switched to narrow band UVB instead until my repigmentation was virtually complete. I also suspect that having a relaxed attitude towards the whole process helped. Because I had no real expectation that the supplements would work I didn’t stress over it. After all, I’d lived with vitiligo for 50 years already and it was so widespread that I took the view that it couldn’t really get much worse but that any improvement would be a bonus. This also meant that I was quite patient during the regimentation process. I didn’t care how long it took because once it had started I felt sure it was going to continue. Within a few weeks of starting the supplements and sitting in the sun for about 20 or 30 minutes a day, I started to notice a few freckles appearing in some of the white patches and these continued to develop over the weeks and months, eventually joining up to produce normal looking skin. My chest and the patches around my eyes were the first areas to start re-pigmenting, followed by my arms and hands. I can’t begin to describe how excited I felt about this. I had never in my entire life seen any real improvement in my vitiligo and I had really given up any all hope of recovery. I continued to take both supplements for about 18 months at which point I had regained roughly 95% of my lost colour. I now only take a short top-up course of Boost from time to time (mainly when I go on beach holidays) but I continue to take the green superfood daily because I believe that this is the reason I have not lost any of the pigment I regained and am still seeing improvements 5 years on. I still have some white areas on the tops of my feet and some mottled colour on my hands but that’s about all. My theory is that the ingredients in Boost triggered the return of the pigment lost due to my poor digestion and the Five a Day+ is what keeps my nutritional deficiencies in check on an ongoing basis. So I don’t consider myself cured, as such, but rather recovered and under control. Oddly enough, I haven’t actually read any books about vitiligo but I do a huge amount of online research on the subject for my blog and I have put my whole vitiligo story online which keeps growing and growing to the point where it is almost a book in itself! However, a book I did find vey therapeutic several years ago when I was struggling with the complications of living with vitiligo as well as dealing with all of life’s other challenges, was Simple Abundance: A Daybook of Comfort and Joy by Sarah Ban Breathnach. As well as being a spiritually and psychologically uplifting read, the book recommends keeping a daily gratitude journal in which to record 5 things a day for which you feel grateful. Once I had practised this discipline for a week or two I started to appreciate the healing power of gratitude. It didn’t heal my vitiligo but it did take my focus off what was wrong with my life and put it firmly on all the good things that I was fortunate enough to enjoy. Whether or not you read the book (it is written specifically for women) I would highly recommend keeping your own gratitude journal. My first tip would be to get a proper diagnosis from a qualified dermatologist. 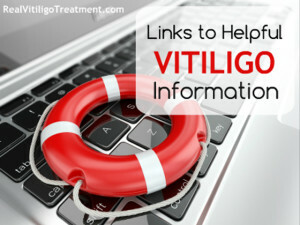 There are several other conditions that are sometimes mistaken for vitiligo, and which are much easier to treat, so it’s as well to be certain what you are dealing with before you start. When you go to see a doctor it’s important to be prepared for the fact that most mainstream medical professionals do not understand how distressing vitiligo can be and tend to be a bit dismissive. Most general practitioners will tell you there is no cure and little chance of improvement or recovery. I would strongly advise you to ignore that opinion because it is not helpful and it is not based on reality, as I now know from my own experience. So my advice is to stay focused on getting a correct diagnosis and information on what treatments are on offer, if any, from your health provider. Assuming you are diagnosed with vitiligo, the only treatment I can recommend from personal experience is a nutritional approach because that is what has worked for me. If you want to replicate everything I did, it is all described in detail on my website and you are also more than welcome to contact me direct with any questions. I obviously can’t guarantee you the same results as I had because we are all different and your vitiligo might not have the same cause as mine. But, even if this approach isn’t right for you, there are other treatments out there that might be. If my experience is anything to go by, your lost pigment is not dead. It’s just dormant. So you have every reason to expect it can be awoken once you have created the right environment for your body to be able to start healing itself. Perhaps the most important tip of all though is not to put your life on hold while you wait for your vitiligo to disappear. Life is too precious to spend it living for tomorrow. 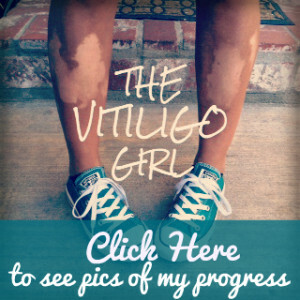 You can find my whole vitiligo story and blog at www.thevitpro.com and contact me at info@thevitpro.com. I do answer every message sent to me but please allow a day or two in case I have some catching up to do :). Can I get the BoosT and 5 a day in the USA? Wonderful Story, I am really inspired from your story. you have set the example, who’s loss the hope. I too found her story to be sooooo encouraging! Thank you both for spreading the hope! I love her story too! She is such an inspiration and the ultimate example of why we should never give up! I’m sorry to hear you have been diagnosed with vitiligo but glad that you have decided to be proactive about treating it. I know it’s easy to say, but try not to be too anxious about it. I know from experience that vitiligo is reversible and the good news is that you are catching it very early so you stand a better chance of it responding quicker. To answer your question about the supplements I use, yes – they are from the UK and I buy them from this website: http://www.buyxenca.com. I don’t think these exact formulations are made anywhere else but they do ship all over the world. The Boost capsules are listed in the “Nutrition and Wellbeing” area of the site and the Five a Day+ green food is in its own section. It comes in powder or capsule form (both are the same – just a matter of which format you prefer). I take the capsules if I am travelling because they are convenient. But they are more expensive than the powder so I use the powder when I am at home. One jar of Boost lasts a month. Five a Day+ comes in various sizes and the 500g powder is the best value for money. Based on one teaspoon a day, each 100g will last about a month. But I would actually recommend taking two or three doses a day, at least until you are happy with your repigmentation (hopefully) after which you could reduce it to one. If you would like more information about the ingredients and exactly what I did to repigment you might find my story site useful – http://www.thevitpro.com. I have put everything onto it that I could think of that might help anyone looking for answers and you are also welcome to get in touch directly if you want to ask me anything. I love to read success stories … Is your vitiligo still actively spreading as well as repigmenting?